Eurocom has worked extensively with “Blue Chip” companies both in the UK and overseas. Our approach is technically innovative and flexible. We have successfully executed large and complicated engineering projects on time and within budget. The following list represents a cross section of the contracts delivered by Eurocom. Eurocom are called upon to support UKPN to maintain and fault find their control systems around the Tfl power substations and control centres. Eurocom have assisted Sensieve with the recent monitoring systems that were required during the tunnel ring maintenance works along the Jubilee line. Eurocom have been awarded the contract for the PA/CCTV Asset Stabilisation Works for both Charing Cross and Embankment stations. Eurocom are currently installing, terminating and testing 22km of Fibre and associated containment and bracketry route between UKPNS Substations on LUL. Eurocom installed the system control racks and cabling at the new Highgate SCC facility for Thales UKPNS Powerlink Fibre Eurocom was responsible for the Design, Installation (including all CMS routes) and the Testing of a new fibre network between LUL Stations and UKPNS Substations on the Jubilee Line. Eurocom carries out the design and installation of the Optical Fibre backbone for the control of the CTP ventilation system on the Victoria line for VVB and Costain. Eurocom designed and installed the specialist lighting and power upgrade at the Surrey and England, Oval cricket ground. The work was carried out to ECB recommendations. As principal contractor for CBS (Viacom Outdoor Ltd) we had responsibility for the design and installation of the Digital Transformation project on London Underground. This included the LAN/WAN networks and power supplies for the digital escalator panels, LCD’s and cross track projectors. Eurocom carried out the interim maintenance on behalf of Tubelines of communication systems and their power supplies on the first 22 refurb stations during the refurbishment programme. Eurocom also assisted Telent in taking them into the full maintenance contract. Eurocom made a substantial contribution to the project management and implementation of Communication and LVAC Systems on behalf of Marconi plc on the Jubilee Line Extension Project, and we continue to support Telent on LUL projects. We also received a commendation from Tubelines for our contribution to the installation and integration of the communication systems for the opening of the East End entrances at Canary Wharf station. Eurocom on behalf of its clients Thales and Fluor Ltd, has undertaken surveys and designs for gathering data on communications, radio and electrical transmission assets, associated power supplies and cable management infrastructure on all London Underground sites. Eurocom provides support to London Underground Ltd and third party clients providing Communication Asset Dilapidation Surveys, Third Party Fibre Optic and Project Surveys, and also managed third party implementation carried out on behalf of London Underground and Transport for London. 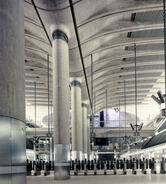 Eurocom provided Project management and Engineering teams to assist London Underground in house on a number of projects. e.g. OPO CCTV, Section 12 CCTV/PA, Depot Security and Telephone Network Upgrades. Eurocom has undertaken surveys for the installation of a telecommunications network in Manaus, Brazil and the project engineering of a SCADA system installed along a 900km oil pipeline in Pakistan. As well as the installation and commissioning of an Air Traffic Control and Fixed Telecommunications network in Ghana, West Africa. Singapore and Hong Kong On behalf of GEC Singapore, Eurocom undertook the project engineering and supervision of two capital local electrical projects. A six man electrical management team was in Singapore and operational within 72 hours of notification. Eurocom, on behalf of GEC Hong Kong, have also provided an installation and commissioning team to supervise local contractors on the Metropolitan Transit Rail System. Within a week of notification we had a team of twelve engineers operational and on site for eighteen months.